Hanako Maki | The PHOENIX A Loyola student was taken into Campus Safety custody outside the men's basketball game versus Illinois State University on Saturday afternoon. Many Loyola students are outraged after they say the university’s private police force, Campus Safety, was racially biased and used excessive force against two Loyola students over the weekend. 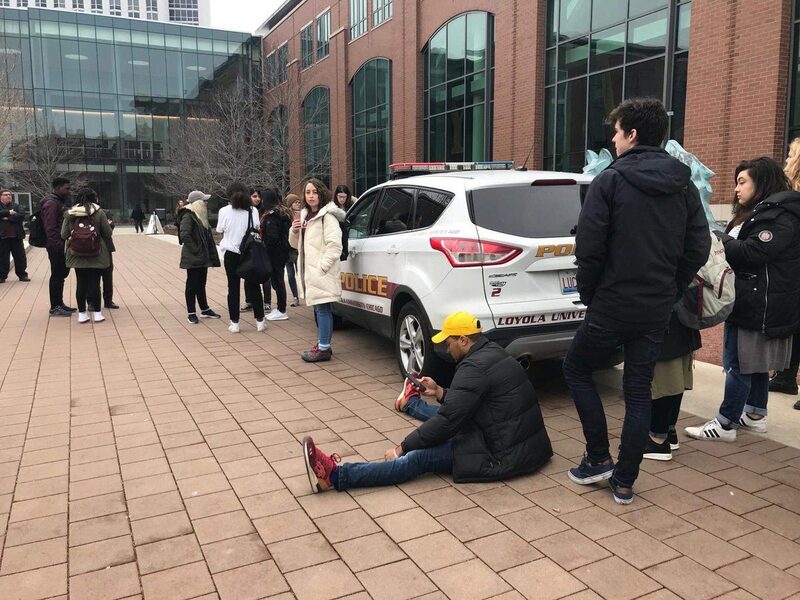 Campus Safety took a Loyola student into custody outside of Saturday’s sold-out men’s basketball game for intervening in a campus police search being performed on two black males — said to be scalpers — at the entrance of Gentile Arena. Some students believe Campus Safety’s actions were racially unjust. Students have since taken actions in attempts to hold Campus Safety accountable, starting a petition which has since garnered more than 1,500 signatures, holding a walkout Feb. 28 and scheduling a town hall meeting for March 1. 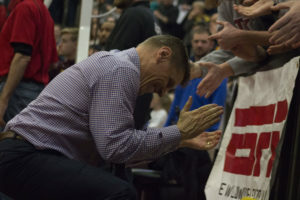 The university released a statement Feb. 25, which said two individuals were approached by Campus Safety police officers for allegations they were scalping tickets outside of the men’s basketball game. The Loyola website states the reselling of tickets outside of Gentile Arena is prohibited. Both men were not Loyola students. Campus Safety is a sworn police department that handles law enforcement and campus safety issues at Loyola. Loyola later issued a revised statement. It acknowledged the heightened sensitivity to racial profiling by law enforcement, and said the issue on Feb. 24 was not about race, but about safety for the attendees of the basketball game. To further address community concerns about racial injustice, Loyola President Jo Ann Rooney sent a letter to the student body Feb. 27. She stressed Jesuit values and said there will be listening sessions with students, faculty and staff in the second half of the semester. “What I am hearing very clearly is that we can and must do more,” Rooney wrote. The incident occurred Feb. 24, when student organizers from Students for Reproductive Justice, Loyola Young Democratic Socialists, Students for Justice in Palestine, the Black Cultural Center and African Student Alliance (ASA) and other student supporters, were protesting against the university’s funding of a new athletic facility, scheduled to begin construction this spring. They were standing in front of the entrance to Halas Recreation Center when they saw the two men being searched. Alan Campbell, a senior at Loyola, said he saw the men being patted down and approached the officers and two men. Campbell was later taken into custody by Campus Safety after interfering. Loyola’s statement said Campbell refused to identify himself as a Loyola student and did not comply with the officer attempting to keep Campbell away from the investigation. It also said the Campus Safety officer struggled to handcuff Campbell because of his resistance, and Campbell was taken to the ground. Campbell strongly denies that he was physically involved in the incident before he was handcuffed by police. Loyola’s student handbook states students must present their ID when asked by a university official in an official capacity. Campbell said he thought Campus Safety took inappropriate disciplinary actions when responding to the incident. “There was excessive force used by Loyola’s police department. They were searching, spread eagle, two black males while we were protesting,” Campbell said. “It was unjust, it looked completely wrong that Loyola was taking that action completely out in the open.” Another protester, Paloma Fernandez, a senior and friend of Campbell, took action by defending Campbell. Fernandez said Campus Safety took the two men to another location, and Campbell followed while chanting on behalf of the two men. “Alan kept chanting that these men should be let go, that they were not doing anything wrong,” Fernandez said. Fernandez said at that point, Campus Safety forcibly detained Campbell and brought him to the ground. “I was trying to help Alan as well, and that further annoyed one of the cops and he put his attention on me, grabbed me, pushed me against the wall,” Fernandez said. The statement and video footage confirmed Fernandez was physically restrained by the officers. Tori Windham, a sophomore, said she was walking through Damen with a friend when the events transpired. Windham said she saw the officers get physical with both Campbell and Fernandez. “They handcuffed him and pinned him to the ground, and then they grabbed Paloma by her shirt. It was extremely uncalled for,” Windham said. Other students came to Fernandez’s aid. She was eventually let go. The two men who were scalping tickets were detained, questioned and were eventually released with a verbal trespass warning, Loyola’s statement said. Here we’ve had numerous problems in and around the university with robberies and rapes and these idiots are blocking police efforts without even knowing why the two were being detained. Were the two wanted in question with a recent or past incident on campus? Without knowing these protesters took it upon themselves to intervene without knowing the facts. Like I said–idiots. I was there, and I can assure you that NOBODY was blocking police efforts without probable cause. The student witnessed two black men being racially profiled and patted down while all other passers by were having no problems getting into the basketball game, and this student simply asked the campus safety officers what they were doing and why they were frisking the men–which he had every right to do as a concerned bystander. OK, Amy. What was the ‘ probable cause’? You are claiming these two were being ‘racially profiled’. Why? There were probably a thousand or more minorities entering The Joe to watch the game. Why weren’t they ‘racially profiled’? Your assumption without proof holds no water. The arresting officers have the right to not to be interfered with when doing their jobs. Thank you. At least someone can still reason in the face of anarchy. Anarchy? I do not find it odd that the two of you would defend the officers (assuming you are both white). You are viewing the story with biased eyes. Whether the young man was misguided or not, four grown men on a slim young man is excessive. Did you even watch the video? What I got from the video and the poorly written article is that the cops over reacted. Consider the crime and context and honestly ask yourself, did their response fit the supposed crime? Would they have treated a white student the same way? My comments were based upon the facts as presented by the article. Do not make assumptions about me or present hypothetical situations that support your assumptions. As an alumni, I would hope that all students can feel safe on campus and hope that they can rely upon campus police when they are needed to ensure their safety. That is all. Do not read further into it. No hidden agenda. If the facts in the article were wrong, then the author has a responsibility as a journalist to address that. Mmm, 2 individuals were breaking the law and a loudmouth Loyola student makes a fool out of himself, trying to create a divisive polemic based upon his own misguided anger, facts be damned. Other students indignantly chime in, facts be damned. This is not my Loyola. Then considering the men in question were released *with a verbal trespass warning*, it is logical to assume you were approached by different men and your swashbuckling tale has no bearing on this incident. Considering you were not present, your idiotic argument has no bearing on this incident. Then why did the cops release them if they were in fact scalping? Hmmm? *Something* about their appearance, perhaps? Gee, maybe they were let go because (as Wowser stated) of their ‘white privilege’ . Oh, wait–I forgot they weren’t white. Never mind. They did. *Something* about having a backpack outside of a sold out game, and refusing to provide proof of being a student when asked: Despite that being against the student rules of conduct. When a campus safety officer asks you to provide your student ID card, you ARE required to do so. He did not. And guess what! He was handcuffed until they could prove he WAS a student. So two guys who happened to be black, were incorrectly stopped and searched and let go due to not breaking any laws. Another black man tries to help, and he gets arrested. The cops even manhandled the woman in a manner that shows their bias. Hello everybody, here every one is sharing these familiarity, so it’s good to read this weblog, and I used to pay a visit this webpage daily.